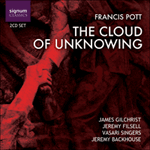 The Cloud of Unknowing opens with a sombre organ introduction. The first choral entry  evokes a kind of Eden. Lines from Psalm 90  interact with passages from Heroic and Elegiac Song for the Lost Second Lieutenant of the Albanian Campaign, 1945. This poem by the late Cretan poet Odysseus Elytis is an almost tribal eulogy, its pathos derived from contrast between the happy intimacy of a soldier’s village origins and the futility of random extinction on a battlefield. A tenor solo is introduced , leading to the premonition ‘something evil will strike’. The soloist typifies a deliberate tendency for identities to blur at particular moments throughout the work. At various points he will assume the guise of prophet, reluctant soldier, Christ figure or worldly Everyman. In essence his is the voice of human conscience, frequently drowned but still insistent amid the sound and fury of war. At  his vision of the Four Horsemen of the Apocalypse launches an immense process leading right to the central climax of the work. After the onset of an agitated Allegro this text alternates with words by William Blake which uncomfortably locate the roots of evil in every human heart. The vision of Death, the last Horseman, is an enervated whisper. A rhythmic tramping arises from the depths, evoking the mobilisation of an implacably hostile force. The music  suggests an inexorable army on the march by allowing syllabic stresses to ride roughshod over conventional expectation. A free approach to text highlights ‘shall’ [march every one on his ways] and ‘shall not’ [break their ranks]. Eventually, like some culinary reduction, this ‘boils down’ to the single word break, inhumanly repeated over organ trills. In a quieter section , laments of the oppressed give ground to a single voice from within the chorus, tremulously questioning ‘who will rise up with me against the wicked?’. This elicits a casually indifferent statement of murderous intent: ‘yea, our God shall destroy them’. At  the soloist—increasingly an impotent intercedent for peace—admonishes warring humanity with words from a French poet, René Arcos, who survived the Great War: ‘the dead are all on the same side’. In response the hostile marching returns. Two sides are now in direct conflict, one inexorable, the other bent upon its annihilation. One faction (by now clearly representing the contemporary West) utters self-righteous pronouncements suggestive that any atrocity is sanctioned by certainty of God on its side: an entirely deliberate indictment of two modern governments for a grievously misguided conflict. Implacable mutual opposition is again embodied by antiphonal use of ‘shall break’ [my arms shall break even a bow of steel] and ‘shall not break’ […their ranks]. Both sides ignore the despairing soloist. As before, the process attenuates to the monosyllable ‘break’. The spectre of the prophetically envisaged final Horseman returns. His name this time precipitates uproar. A headlong climax  enlists that (marginally altered) ‘taboo’ verse from the Psalms which glories in dashing the foe’s children against the stones. An extended organ interlude finally recedes from the noise of battle into remote stillness . The soloist, reluctant participant in all that has gone before, sings words written by the Great War poet Wilfred Owen in a letter home to Osbert Sitwell from the trenches. Owen likens the individual men in his command to the suffering Christ; himself to Judas. This leads into Psalm 23 . With the second half of the work battle returns, but the perspective is now that of Elytis, akin more to the telephoto lens of modern journalism in the field than to the ageless hostilities addressed earlier. ‘Something evil will strike’ recurs as a ghostly echo, reaching sudden consummation in a single gunshot. Elytis now strikingly conjures pathos by matching the tragedy of spent life to ostensibly whimsical imagery. When the chorus re-enters , words from Christ’s final moments follow Owen’s cue, subsuming the anonymous, solitary end of the unknown soldier into the archetypally lonely, forsaken death of the Cross. This seems to be the intention of Elytis, too: ‘The love inside him was such, The whole world emptied with that very last cry’. His image of ‘one moment deserting the other’ is met here with a progressively still organ solo, its note values extending as the pitches of melody and harmony gradually part company. Ensuing music  sets lines by the 17th century mystic, Thomas Traherne. ‘Who art Thou?’, addressed to the crucified Lord, is answered instead by the slain soldier (in a line of Owen made musically famous by Britten in his War Requiem, and one from Arcos): ‘I am the enemy you killed, my friend. The dead are all on the same side’. The remaining music  is a kind of moral epilogue. Despite providing the work’s title, the text here was the last thing to fall into place. Conceiving a textual ‘mosaic’ is a matter less of lighting on things and recognising one’s wish to set them, more of knowing what one hopes someone has said and then tirelessly searching. The enigmatic mediaeval tract entitled The Cloud of Unknowing was a late, stray idea which I almost failed to follow up. Written during the last quarter of the fourteenth century in the dialect of the East Midlands, it is believed to be the work of a Carthusian monk who took pains to hide his identity. Although addressing a specific form of religious contemplation (held then to unite the Christian soul with the being of Christ), the author was intent upon linking this with an active charitable compassion for others. Certain passages strike the modern reader through their worldly note of humanitarian engagement. These provided the summing-up which my own (as yet unnamed) Cloud required. The Epilogue starts much the same as the work’s opening, offering a semblance of symphonic recapitulation. An arioso tenor solo follows, emphasising the poignant brevity of earthly opportunity to be a force for good. Again the chorus returns to Psalm 90. Its earlier music provides a backdrop to the true heart of the soloist’s message for the modern world, leading to the exhortation ‘…lift up thine heart with a blind stirring of love; for if it begin here it shall last without end’. The chorus reiterates this text , inexorably expanding it in imitative polyphonic style. An immense climax is sustained into a prolonged Amen, which subsides until the soloist is heard intoning ‘farewell’, as if emerging against the flow of some great retreating procession. His valedictory blessing  leads back to undespoiled Eden . The chorus returns (Elytis): ‘the whole world emptied with that very last cry’. In response, the soloist’s last utterance is a desolate echo from the Cross at Calvary. A final Amen  fades ever further into the distance before a prolonged and mysterious organ chord enfolds all in its own seemingly eternal cloud of unknowing. This work stands at some distance from the conventions of Anglican worship, the forbearance for which it calls being humanist in essence before it is specifically Christian or devotional. I had wished to write something of this kind long before the Iraq war and its aftermath lent their particular focus. In the event, the music espouses that same ‘need to bear witness’ articulated by surviving members of the Jewish faith after the Holocaust, but emanating since from innumerable other conflicts. Such witness chooses here to embrace innocent victims from all faiths and ethnic strains, be they of Muslim, Jewish, Christian or any other persuasion. In memoriam: Margaret Hassan and all innocent lives lost in or beyond Iraq. Invocation of one of Iraq’s more grievous individual losses is emblematic, and made without permission; the sentiment behind it one of personal revulsion at the hollow eulogies of western leaders mired in blood no less than those they would condemn. Lord thou hast been our refuge: from one generation to another. Before the mountains were brought forth or ever the earth and the world were made: thou art God from everlasting and world without end. I was in the Spirit on the Lord’s day. The shudderings of death attend my steps. had a pair of balances in his hand. and Hell followed after him. and they shall not break their ranks. Yea, our God shall destroy them. and mine arms shall break even a bow of steel. that sat on him was Death. Let them be wiped from the book of the living. and dasheth them against the stones. and his blind fingers loosed? …not to imagine he thirst till after the last halt. inspected his feet that they should be worthy of the nails. at attention before his accusers. with the topography of Golgotha. For those men night was a more bitter day. Of death-let fate say what she will. For one moment only, roots shook in the soil. To beguile the infernal tumult. Like a garden the birds have suddenly deserted. Movement 19: My God, why hast thou forsaken me? Like an angel’s watch that has stopped. He lies on the scorched cape. Bay at the terrible silence with dogs’ skeletons. No one heard that last, that final cry. The whole world emptied with that very last cry. O do not look at the place where life has left him. …The whole world emptied with that very last cry. And this is the way the all-powerful sun suddenly deserts the world. Is this He that was transfigured upon Mount Tabor? … didst Thou suffer for our sakes! Thy blood all droppeth on every soul. and the rocks to rend, and the graves to open? From night to night and now. In the evening it is cut down, dried up and withered. Clear sight shall never man have here in this life. And therefore shape thee to bide in this darkness. In one little time, as little as it is, may heaven be won and lost. …how full of peace …would the world become. upon this cloud of unknowing that is betwixt thee and thy God. nor weep for the Passion of Christ. nor houseless, nor in prison. what pity and what Mercy shall God have then. For if it begin here, it shall last without end. may heaven be won and lost. Farewell, ghostly friend, in God’s blessing. be with thee and all God’s lovers on earth.